DH brought this sweet yellow dress back for L from the Virgin Islands. It's a perfect fit and so sweet! She is just beautiful! And that dress looks so adorable with her hair color and complexion. Precious! 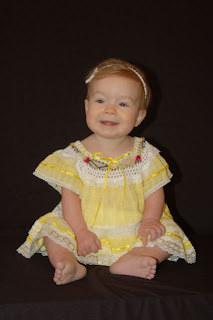 What a great pic - lovely baby and such a pretty, sweet, sunny little dress!